VFL: Sunday's win in 60 seconds Get a snapshot of Collingwood's three-point win over Richmond in 60 seconds with Collingwood Media. The VFL Magpies have defeated Richmond by three points at Punt Road Oval to win their third consecutive game. On a sunny Melbourne day, hearts were racing and hands were clapping at the home of the Tigers as the Magpie Army once again witnessed a thrilling finish. As the hours ticked down to Collingwood and Richmond’s AFL showdown, many fans opted to witness a promising VFL clash on their way to the MCG. They weren’t disappointed as the Magpies raced to a 28 point lead at half time, before Richmond kicked five goals to one in the third quarter. Collingwood assistant coach Craig McRae found encouragement in the team’s ability to close out another close game despite the opposition holding the momentum. “Richmond played terrific in the third quarter and the last quarter and they made it really hard for us,” McRae told Collingwood Media after the game. “Their midfield got a hold of us. They were touching the footy first and getting the clearances, which meant that we were having to defend a lot. “But our backs held up… and the guys down there really supported each other well. After trailing for the entirety of the game, Richmond found the lead in the early stages of the final quarter. Collingwood replied with a snap from Jack Blair before Tim Allan and Jack Hellier kicked goals to confirm the three point victory. Hellier’s goal came from one of a number of 50 metre penalties as the umpires looked to control a game with was brimming with emotion. AFL emergencies Alex Fasolo, Sam Dwyer and Corey Gault all took the field and had vital impacts on the game. Fasolo was dynamic in setting up a number of scoring opportunities in the first half before he was taken out of the game at half time and sent to the MCG to be on standby for the AFL game. Gault assisted Mason Cox in the ruck against the in-form Shaun Hampson while also kicking a first quarter goal. 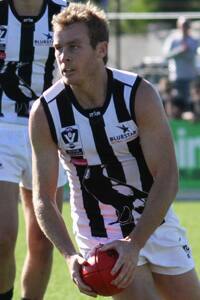 Meanwhile, Dwyer was named best afield for his 21-disposal, one goal performance. Despite a spread of 11 different goalkickers, Michael Still continued his strong run of form with another four goals. While playing down his own performance, Still told Collingwood Media the team has addressed the fluency between the midfielders and the forwards in recent weeks. “We had a lot of forward 50 entries but we weren’t getting it to the right spots… we look pretty dangerous when the balls coming in quick and it’s pretty hard to defend,” Still said. After eight goals in two weeks, McRae and the rest of the coaching staff are well aware of the potency of Still at full forward. “He’s a really important player for us,” McRae said. After three weeks of gathering momentum and form, the VFL Magpies have a chance to refresh this week as they face the bye. The side returns in two weeks’ time for a clash with Coburg at Coburg City Oval.